Spend Father's Day at Super Dad event happening on June 18, 2017 at 2:00-7:00pm at SM by the Bay at SM Mall of Asia in Pasay City. 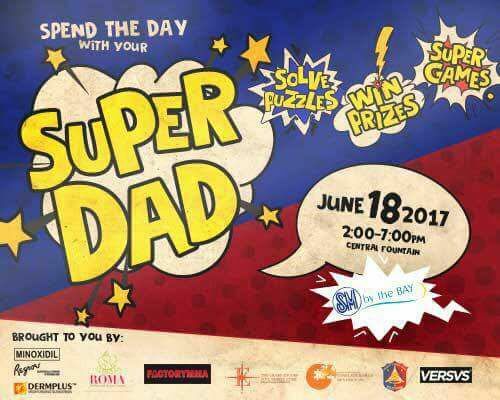 Join the fun-filled afternoon of games and surprises. Bring your Dad, Single Mothers who has Daddy roles, Lolos, Fur Dads and the friend who has always been there for you. Show your love, respect and trust while having FUN. Admission is FREE! Presented by CONFLATE WORLD DYNAMICS INC.